SAM D21 interrupt operation must be carefully initialized by the application developer. This page summarizes the key initialization and usage steps required for using peripheral interrupts in an application. We will use the GNU compiler collection (GCC), running within the Atmel Studio 7 IDE. Examples use the ATSAMD21J18A MCU. 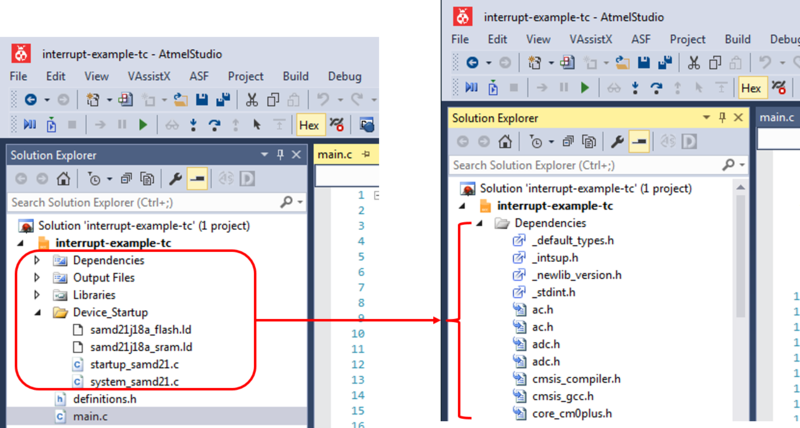 For a GCC C Executable-type project in Atmel Studio 7, all required interrupt support header/source files are included when you first execute Build > Rebuild-All. Default handler functions are defined in startup_samd21.c. Note that these functions are defined as “weak”, so you can override them with your own implementation. We will briefly review the SAM D21 Timer/Counter module in this section in order to provide a specific example of enabling a peripheral interrupt. In this example, we configure the Timer/Counter 3 to generate compare interrupts every 100 ms, using a 1 MHz CPU Clock and GCLK0. The Timer/Counter (TC) module provides a set of timing and counting related functionality, such as the generation of periodic waveforms, the capturing of a periodic waveform's frequency/duty cycle, and software timekeeping for periodic operations. TC modules can be configured to use an 8-, 16-, or 32-bit counter size. The compare, "waveform generation" mode is set to 'Match Frequency Operation', whereby the period time is controlled by the value in the CC0 register. WO may be optionally connected to an external MCU pin. Each peripheral module has their own set of interrupt registers, which must be set to enable interrupt generation. To set the TC3 interrupt priority level (0, 1, 2, 3), call the NVIC_SetPriority() CMSIS function included in the core_cm0plus.h file. Recall that a higher priority number parameter corresponds to a lower interrupt priority. To enable the TC3 interrupt, call the NVIC_EnableIRQ() CMSIS function included in the core_cm0plus.h file. Go to the NVIC example project to see a complete working project, or the NVIC overview page to review the Cortex M0+ exception model and NVIC functionality.